the little girl I met. | escaped. 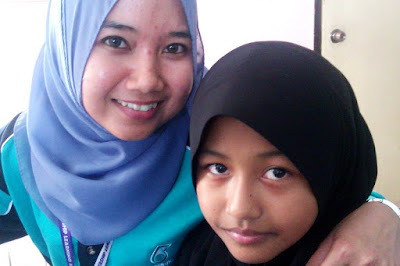 the little girl I met. I met her when we went to this rumah anak yatim for our community service session during the induction, and I still remember her excited face when we first reached there. In fact, I still remember each and everyone's face there - they were excited to see us, and yet too shy to even say a word. We had a drawing session for the girls, and she drew a pretty girl with a blonde hair. When asked, she said she thought it was pretty. For a girl who's not brought up in a fancy home with Astro's Disney channel to influence her with blonde princesses and whatnots, I was really touched. It humbles me to see these girls who either lost their parents or still have parents but they just couldn't afford to raise their kids, because in a way, I'm really one of them. Our fate is somehow the same - but totally different. I lost my dad when I was a teenager, but the only fine line that lies between me and them is I'm lucky to have a mother who could afford to give us shelter and a decent-enough living - while these kids don't. It humbles me to think that if I didn't have that, God knows where I'd end up to be. And if these kids were given the same chance, maybe they would somehow have a better life now. It makes me realize just how lucky I am, and that my Mum is really a superhero.